Thousands of pairs of rubidium atoms participate in a “quantum square dance” that may be useful in quantum computers. GAITHERSBURG, MD—Physicists at the Commerce Department's National Institute of Standards and Technology (NIST) have induced thousands of atoms trapped by laser beams to swap “spins” with partners simultaneously. The repeated exchanges, like a quantum version of swinging your partner in a square dance but lasting a total of just 10 milliseconds, might someday carry out logic operations in quantum computers, which theoretically could quickly solve certain problems that today's best supercomputers could not solve in years. The atomic dance, described in the July 26 issue of Nature (see reference publication), advances prospects for the use of neutral atoms as quantum bits (qubits) for storing and processing data in quantum computers. Thanks to the peculiarities of quantum mechanics, nature's rule book for the smallest particles of matter and light, quantum computers might provide extraordinary power for applications such as breaking today's most widely used encryption codes. Neutral atoms are among about a dozen systems being evaluated around the world as qubits; their weak interactions with the environment may help to reduce computing errors. Led by Nobel Laureate William Phillips, the NIST group demonstrated the essential part of a so-called swap operation, in which atom partners exchange their internal spin states. (Spin can be visualized as a rotating top pointing up or down.) In the binary language of computers, the atoms swap values from 1 (“spin up”) to 0 (“spin down”), or vice versa. Unlike classical bits, which would either swap or not, quantum bits can be simultaneously in an unusual state of having swapped and not swapped at the same time. Under these conditions, spin swapping has the effect of “entangling” the pairs, a quantum phenomenon that links the atoms' properties even when they are physically separated. Entanglement is one of the features that make quantum computers potentially so powerful. As they swap spins, the atoms pass in and out of entanglement. At the “half-swap” points the spin of each atom is uncertain and, if measured, might turn out to be either up or down. But whatever the result, a measurement on the other atom, equally uncertain before the measurement, would be sure to be the opposite. This entanglement is the key feature that enables quantum computation. 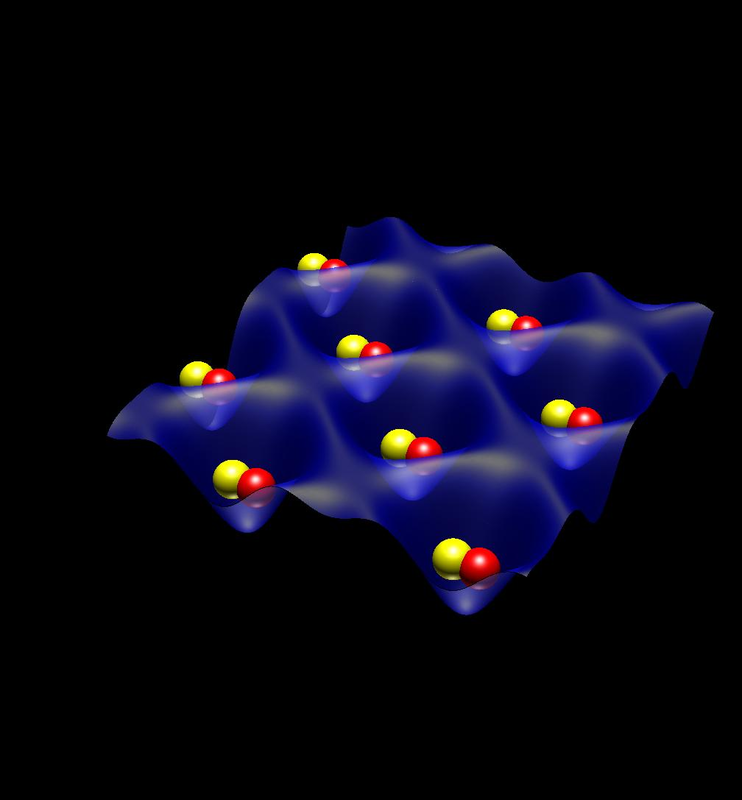 According to Porto, the work reported in Nature is the first time that quantum mechanical symmetry (“exchange symmetry”) has been used to perform such an entangling operation with atoms. The current set-up is not directly scalable to an arbitrary computer architecture, Porto says, since it performs the same spin-swap in parallel for all pairs of atoms. Researchers are developing ways to address and manipulate any pair of atoms in the lattice, which should allow for scalable architectures. Furthermore, not all atoms participated in the swap process, primarily because of imperfect initial loading of the atoms in the lattice. (Some double-wells contained only one atom and had no partner to exchange with.) The scientists estimate that the swap worked for at least 65 percent of the double wells. The NIST group is continuing to work on improving the reliability of each step and on completing the logic operation by separating atoms after they interact. The research was funded in part by the Disruptive Technology Office, the Office of Naval Research and the National Aeronautics and Space Administration. The authors are affiliated with the Joint Quantum Institute, a collaboration of NIST and the University of Maryland.